. : My plan: To have a house that looks like Nikole's. I love the all-white walls!
. : I'm going to make my hair look like I've been swimming at the beach all day... everyday.
.: Another reason to love mid-century modern and Don Draper. If the desk is a-rockin', don't come a-knockin'. Hehe.
.: Primal BLT in a Bowl. Yummah.
.: I'd MUCH rather vacay here than go camping!
. 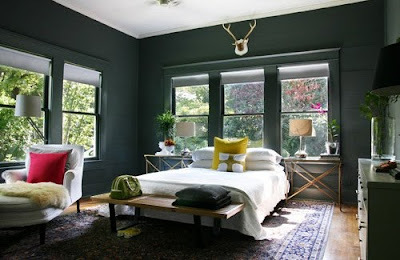 : As much as I love white walls, this all-black bedroom is making me yearn. YEARN, people!
. : How I've been eating. LOVE this. Feeling great. Clothes getting looser.
.: Having a hard time staying optimistic? Here's help. I gotta try the beach hair thing too.